Brands spent $8.4 billion on mobile advertising in 2013, and that number is expected to quadruple to $36 billion by 2017, according to eMarketer. But do mobile display ads—those tiny banner ads that pop up in your smartphone's web browser—actually work? Researchers at Columbia Business School have found that, despite their size, mobile ads can have a big effect on consumers who are in the market for certain types of products. "Digital advertising in mobile channels is experiencing explosive growth," said Miklos Sarvary, co-director of the Media Program at Columbia Business School and co-author of the new study. "But many marketers are still using a 'spray and pray' approach to digital ads. In other words, they're just putting mobile ads out there and hoping that they work. Limitations in tracking smartphone ads have always made it difficult for marketers to track and optimize their return on investment, but we've unlocked a part of that mystery now, which means they'll know how to best to spend their dollars." The research, recently published in the Journal of Marketing Research, is titled "Which Products Are Best Suited to Mobile Advertising? A Field Study of Mobile Display Advertising Effects on Consumer Attitudes and Intentions," and co-authored by Andrew T. Stephen, assistant professor of Business Administration at Columbia Business School and Yakov Bart, assistant professor of Marketing at INSEAD. 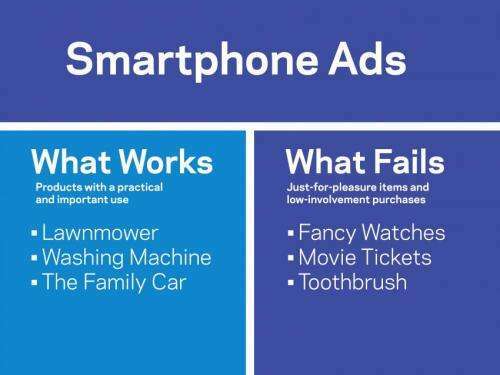 Mobile ads do work for high-involvement products (a lot of time, thought and energy is placed into the decision, like a family car). Sarvary and his fellow researchers looked specifically at the effects of mobile display ads (MDAs) viewed on a variety of mobile devices, including smartphones. The researchers studied survey data from nearly 40,000 American consumers about their reactions to MDAs. The researchers focused on mobile display ads because, unlike text message ads or mobile video ads, the popularity of this mobile marketing tool is on the rise. Over 50 products were represented in the ads, from consumer packaged goods and cars to financial services. After viewing an ad for one of these products on a mobile device, participants were asked to complete a survey that assessed their attitude toward and intention of buying the product. To determine what kind of products are best-served by mobile display ads, the researchers classified each product as either "utilitarian" or "hedonic." In other words, does the product serve a useful purpose, like a washing machine or a lawnmower, or is it typically bought just for pleasure, like movie tickets or a fancy new watch? Products were also classified as being either high or low involvement. Higher involvement products are those that people think a lot about before purchasing. For example, people tend to think quite a bit before purchasing a new minivan, but they don't think too hard before purchasing a low-involvement product, like a toothbrush. What accounts for the results in the above? Sarvary believes it has something to do with psychology. Before making a big purchase, Sarvary explained, people tend to do a lot of rational thinking, comparing one product to another and weighing their options. And this rational thinking is magnified even more if the product being purchased isn't just a new big screen TV, but one that serves a more useful purpose, like a new family car. It might take you weeks or months before deciding to bite the bullet and buy the car you've been thinking so much about, but as Sarvary explained, "During that time, you're debating with yourself about which model of car you should buy. If a display ad for that car shows up on your smartphone, even if it's tiny and doesn't provide you with new information, it'll reinforce what you already know about the product." "The mobile ad's strength," Sarvary went on to say, "Is not adding new data, but reminding you of what you already know and making you think about the product again." These findings carry huge implications for marketers who are planning a multi-channel campaign for a product, Sarvary said. Rather than sticking with a "spray and pray" approach, they might find it's more effective to launch mobile display ads after a product has been advertised in other media. "That way," Sarvary said, "The banner ad seals the deal."